The altar guild is an important behind-the-scenes ministry; members’ efforts help make the church sanctuary visually appropriate and physically neat and tidy. 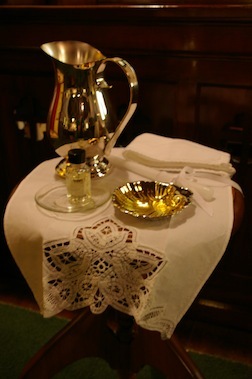 Each Sunday one altar guild member is responsible for filling the cruets with wine and water; getting the communion wafers in the appropriate container and place; putting the season-appropriate paraments on the altar, pulpit and lectern; making sure the correct candles are in place and ready to light; checking to see that the pews are neat and have the hymnals and the Book of Common Prayer available to each person; putting the correct hymns on the hymn board; placing flowers in the designated places behind the altar, and tending to many other small details that together ensure that the Sunday service runs smoothly and that the sanctuary is clean, neat and ready for worship. After the service, that same altar guild member carefully cleans and puts everything away in its correct place, ready for the next altar guild member to set the altar the next week. We love this service to the church and often find that the process of getting things ready becomes meditative and reverential. We feel privileged and happy to know that we are helping to make sure that the Sunday liturgy flows in the way it was intended, unimpeded by service glitches. Our plans for the future include continuing this altar guild tradition to provide the perfect setting for a meaningful worship service.